Careful goes it, we’ve had a massive influx of winged babies reeking havoc in the Side Bars lately. We believe them to be Cherubs as our monkey frescoes have depicted. Although, some would have me to believe those little darlings are actually referred to as Putti, not to be confused with the sticky filler, plumber’s putty. As a monkey I tend to get side-tracked easily, so back to Cherubim! Some believed these creatures to be winged guardians much like the Griffins. The Bible refers to the Cherubim as living, flying creatures, a combination of man, lion, eagle, and ox, to which the lord rode upon. They may have an array of four wings with many eyes representing their all seeing nature. 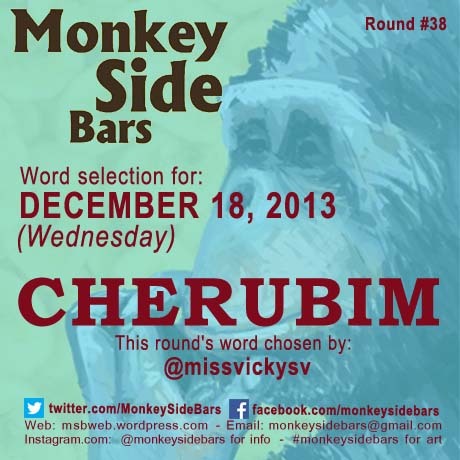 So fly my monkeys, Google awaits you, as you conspire Cherubim for Wednesday, December 18th!